A few weeks ago, I finished up some recipes I had created for Nespresso’s limited edition Grand Crus, Santander and Cauca. A courier arrived to whisk away the Inissia machine I had on loan and I had to face a little empty spot on my kitchen countertop where the machine had sat. It was a little bit sad. But my husband had been dreaming up a surprise for me to replace that empty spot. He bought me my very own Inissia, the very next day, in the vanilla cream color, and she is now my best friend. Yes, I just called my coffee machine a “she”. How rude of me, let me introduce you to Olivia. 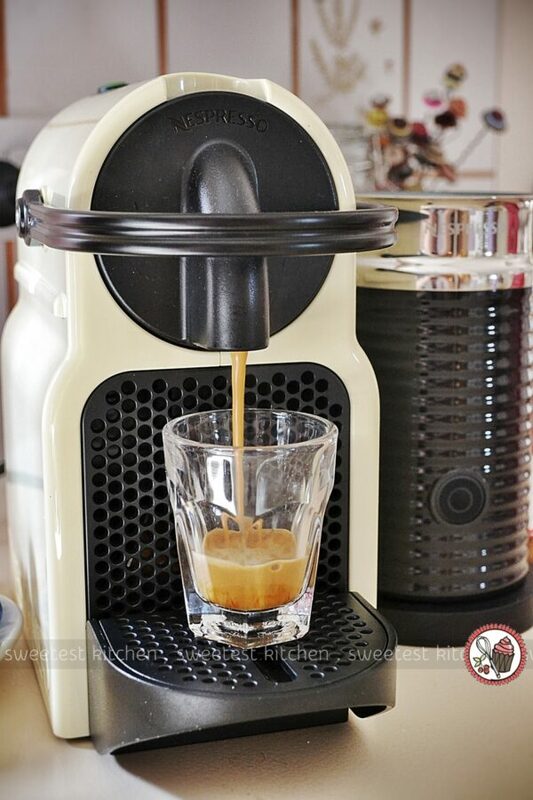 Olivia was busy yesterday, delivering cups of coffee straight into my chilly hands (it’s been a little cold in Sydney lately), as I made my latest recipe for Nespresso‘s newly recreated Fortissio Lungo, which has increased its intensity from 7 to 8. Olivia is always right in the middle of everything, despite how cute and tiny she is, always eager to fulfill my desire for caffeine, and she always ends up with a little bit of stray flour on her after I’ve been baking. I took the above photo after baking the cinnamon rolls for this post just so you can see her all covered with specks of flour and know how hard she works for me. She’s amazing. 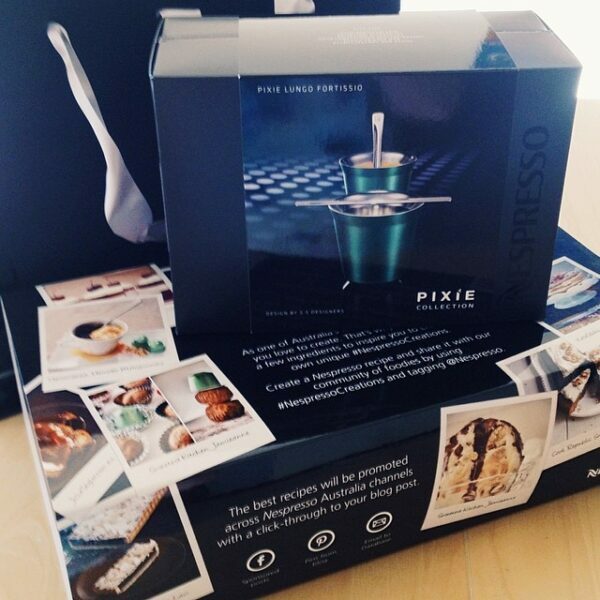 Anyway, I received a wonderful and generous parcel full of ingredients from Nespresso the other week to create some recipes using Fortissio Lungo. The packaging featured two photos of my recipes I had created for Santander and Cauca (alfajore ice cream and espresso brigadeiros), which was super exciting! It wasn’t hard for me to come up with a recipe to make with the new Fortissio Lungo… if you follow me on Instagram, you would have seen my progress yesterday. I decided to use the amaranth flour that was included in the Nespresso package to make cinnamon rolls, and then drizzle them with a glaze made with Fortissio. This was the first time I have ever used amaranth flour (or any kind of amaranth!). The scent of the flour is similar to quinoa, sort of nutty. I replaced a quarter of the flour in my favorite recipe for cinnamon rolls (which comes from Eat. Drink. Love) with the amaranth flour. Otherwise, I did everything else the same as I usually do to make the cinnamon rolls. These rolls are very delicious and easy to make. Even though they incorporate yeast, you don’t need to wait hours for the dough to rise. In fact, they take just a bit over an hour to prepare and bake. I’ve given some of these rolls to a friend after I had heard she had a difficult day, and I made an entire batch for another friend’s birthday as a present. Both friends raved about them. These rolls are just wow. As I was kneading the dough in my KitchenAid, which is also another best friend of mine – her name is Katie, I noticed the dough was a little stiffer with the amaranth, and I had to incorporate more flour than the recipe calls for to keep it from sticking to the sides of the bowl. At that point, the high hopes I had for this version of cinnamon rolls were starting to dwindle. Hopes were rising again as I rolled the dough out, spread it with butter and sprinkled it generously in a sugar/cinnamon mixture. I sliced the dough, and squeezed the rolls into my baking dish. The rolls are then set aside to “rise” for 25 minutes. Oh dear, my hopes started to fall again as the rolls didn’t appear to rise much at all. In the original version of this recipe, the rolls did rise a bit, but I could hardly notice a difference this time. I wasn’t sure if it was because of the addition of the amaranth or if because it was a chilly day and I couldn’t find a good warm spot to set the dish. I put them in the oven anyway, and watched eagerly as the little rolls began to rise and turn golden. I gave them a little more time in the oven than I do for the original recipe. During the baking time, I prepared the coffee glaze. This is a very simple mixture of powdered/confectioner’s/icing sugar and coffee. I extracted one Fortissio Lungo capsule (40ml) and added it to two cups of powdered sugar. After a bit of whisking, it turned very smooth. When the cinnamon rolls were done, I drizzled over some of the coffee glaze – not all of it, but enough to just give a nice drizzling effect (see photo above of the rolls in the baking dish). I spooned over a bit more of the glaze for the photo of the individual cinnamon roll, which lent even more coffee flavor. I could not wait to taste these!! I took photos of the rolls after only 20 minutes out of the oven, as they were soft and gooey and so warm. Oh my, they were so delicious! 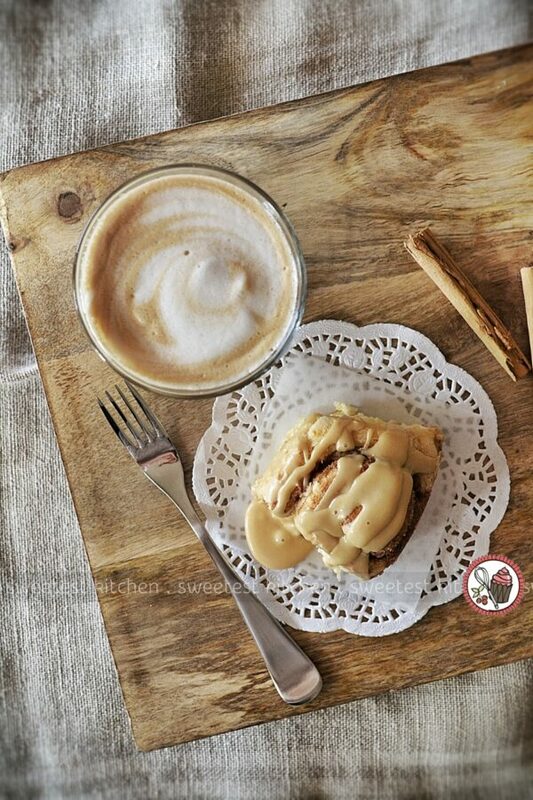 There was the subtle hint of the nutty amaranth, the comforting warmness of the cinnamon and the lovely perk from the Fortissio. They are all kinds of good! High hopes fulfilled! Serve these cinnamon rolls warm with a coffee (Olivia made me a latte for the photos above) for a comforting breakfast on a lazy, chilly morning. Or make them for a birthday present, as I did (albeit with the original recipe). Or share them a friend who’s having a hard day, or make them just for yourself -they’re so delicious, it’s guaranteed your eyes will roll back in your head with the first bite and by the time you get to the gooey center of these cinnamon rolls, you’ll wonder what you were even worried about in the first place. 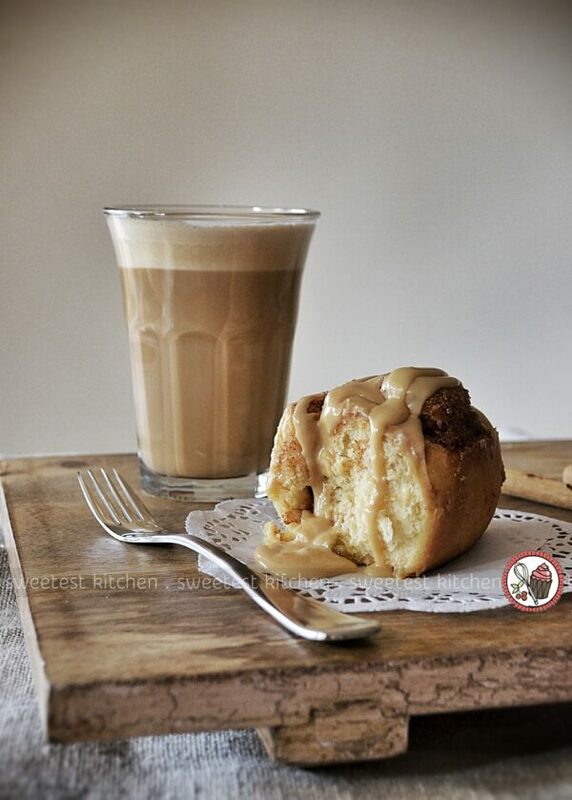 Delicious cinnamon rolls baked with amaranth flour and drizzled in coffee glaze; featuring Nespresso Fortissio Lungo. Author: Adapted from Stephanie | Eat. Drink. Love. Pour the milk into a small sauce pan and heat over medium heat until just heated. Add the butter and stir until melted. Remove the mixture from the heat. Allow the mixture to cool down so that it is still warm, but not hot. While the milk cools, add 3 cups of the flour/amaranth mixture, sugar, and salt together in a bowl and whisk to combine. Once the milk has cooled, add the mixture to the bowl of a stand mixer fitted with the dough hook. Add the yeast to the lukewarm milk and stir with a spoon. Add the flour mixture and egg to the yeast and milk and beat on medium-low speed until well-combined (about 5 minutes). If the dough is sticking to the sides of the bowl, add some of the remaining flour, ¼ cup at a time until the dough forms a ball and pulls away from the bowl (if the dough is still sticking, as it was for me, add more all-purpose flour ¼ cup at a time until it starts pulling away from the bowl). When done, cover with a damp cloth and let sit for 10 minutes. Meanwhile, prepare the filling. 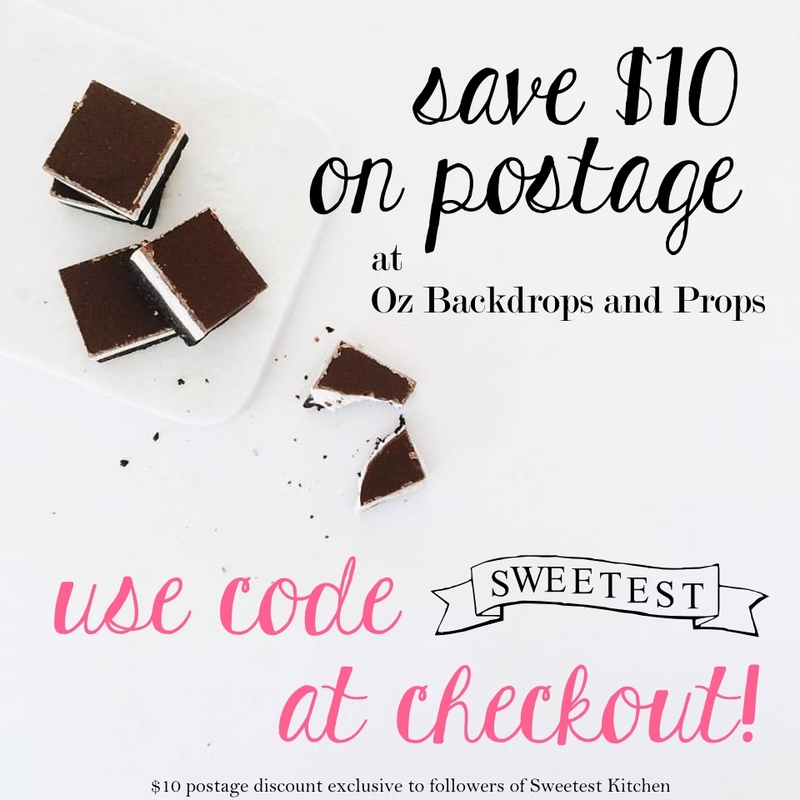 Whisk together the granulated sugar, brown sugar, cinnamon and nutmeg. Set aside. Grease a 9-inch (23cm) pie dish with unsalted butter. When the dough is ready, turn out onto a floured surface. Roll out to a 9x14-inch (23x36cm) rectangle. Spread the softened butter for the filling onto the entire surface of the dough (you may not need to use it all, just make sure the dough is completely covered in butter). Then evenly sprinkle all the cinnamon-sugar filling on top of the butter. Starting with the 14-inch (36cm) side, tightly roll up the dough. Pinch the seam to seal together. To slice, take a knife and gently mark where you want to cut each roll (11-12 rolls total). Then use a knife or dental floss to slice (to cut with the floss, break off a piece of floss about 12 inches (30cm) long. Then gently slide the middle of the floss under the dough to the place where you want to "cut". Pull the ends of the floss up and cross over the top of the dough. Then give a quick tug to cut through. This will give you nice round rolls). Place the sliced rolls into the pie dish. Cover with a damp cloth and place in a warm spot. Let rise for 25 minutes. While the rolls are rising, preheat oven to 350F (180C or 160C fan-forced). Once the 25 minutes is up, bake the rolls for about 20 minutes or until golden and cooked through. Let cool for 3 minutes before icing. Sift the powdered sugar into a bowl. 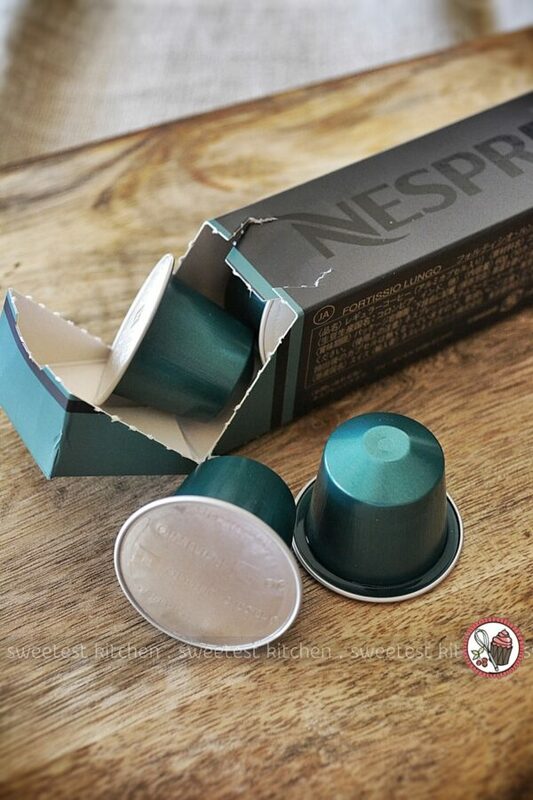 Place the Fortissio capsule into your Nespresso machine and extract it. Pour the espresso into the powdered sugar and whisk until smooth and no lumps remain. If your glaze is still a bit thick, add a tiny splash of milk and whisk to incorporate. Repeat with the milk as necessary. 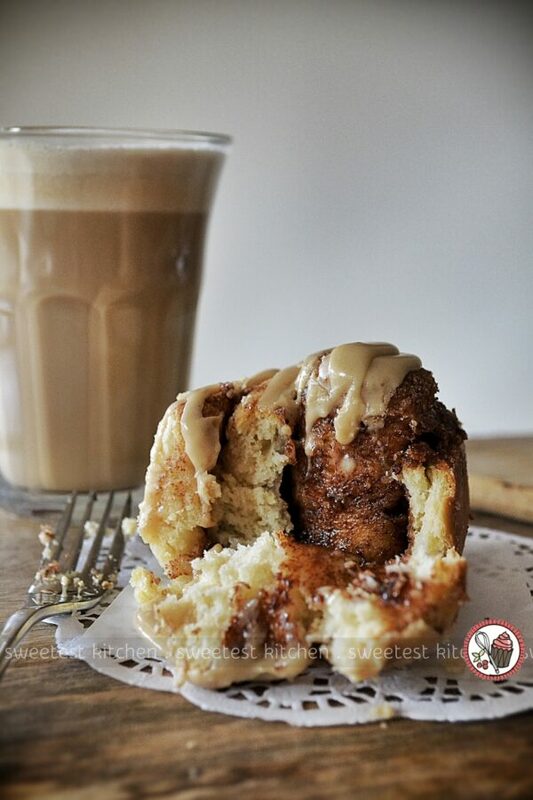 Drizzle the warm cinnamon rolls with some of the coffee glaze and serve immediately; drizzle individual servings with leftover glaze if desired. Leftovers should keep well at room temperature in an airtight container for a day or two. Can be stored in the refrigerator for a little longer. Warm the rolls gently in the microwave for that fresh-from-the-oven taste. That looks so good! Pass one over will you, please? OMG, this looks AMAZING! 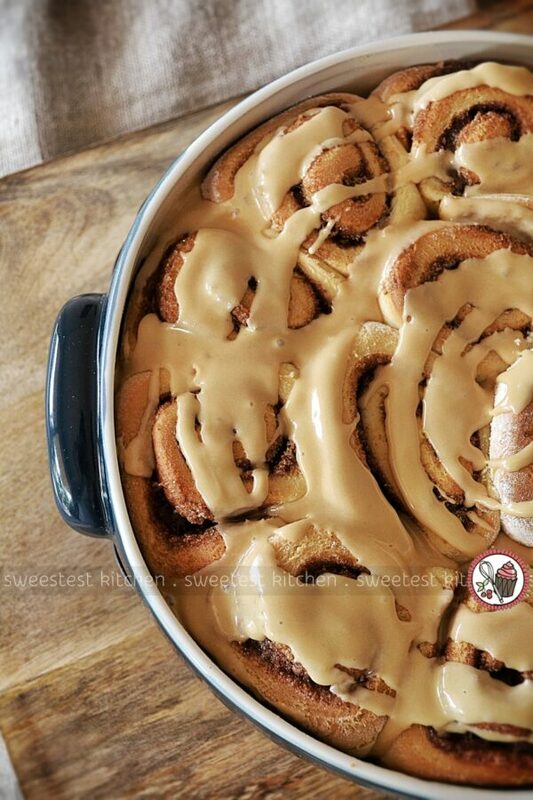 I found your blog on Pinterest searching for Cinnamon Rolls – so happy to find a fellow Sydney food blogger!! And I love your blog design – very familiar 🙂 (pop over to mine and you’ll see why!). Looking forward to trying this recipe!